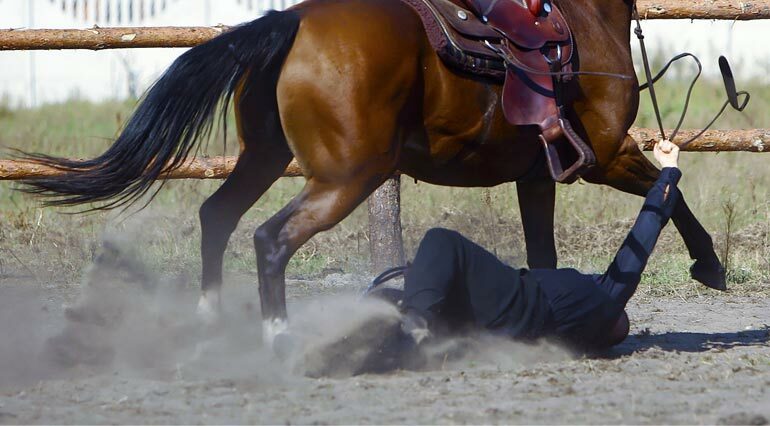 Personal Accident Insurance is a limited form of accident medical expense coverage the Insured Horse Business or Club can purchase for their customers, members, and volunteers. This coverage would be a secondary type of coverage, as the participant’s own Major Medical coverage would, if available, usually be PRIMARY should they incur accidental bodily injury in relation to certain activities sponsored by the Insured. How it pays will be determined by whether the accident victim has major medical insurance and the amount of their deductible. This coverage is for accidents only and not for loss related to disease or illness. To be considered an accident or accidental, it must be sudden and unforeseen and happening by chance. Accidental Bodily Injury means bodily injury which is Accidental, is the direct source of a Loss, is independent of disease, illness or other cause and occurs while the policy is in force. Coverage is purchased along with a General Liability Policy because it is not part of the General Liability Policy. If you are interested, we also provide horse trainer insurance along with equine and livestock insurance because we understand everyone has different needs. Participants in horse-related activities the Insured sponsors or provides: Riding Instruction, Disabled and Therapeutic Riding, Pony Rides, Hourly Horse Rentals, Guides & Outfitters, Horse Drawn Vehicle Rides, and Horse Related Camps. Volunteers participating in activities sponsored, scheduled, and supervised by the Insured business owner. Examples are those volunteers who assist with horse-related programs for disabled, therapeutic, and hippotherapy programs, pony rides, and camps. Members of benevolent Horse Clubs and Associations, while participating in these sponsored events: General and special meetings, show and event competitions, trail rides, fundraising activities and events, including associated set up and take-down, volunteer trail maintenance events, and volunteer club premises maintenance activities. Personal Accident Insurance provides an additional or excess limit of insurance for medical expense for accidents, customers, volunteers, or members may incur while participating in the Insured’s activities. The coverage is inexpensive and is complementary to other insurance that may be available. Payment of a claim is not dependent upon the Insured’s negligence being proven so that a claim can be paid, and it provides a higher and additional limit than the general liability policy provides for Medical Payments. It may be used to pay for all or part of a participant’s major medical insurance deductible or coinsurance amounts. It provides some coverage for those participants that carry no major medical insurance. For clubs and associations, it provides some medical expense coverage for members, when the liability policy would provide no coverage for member’s bodily injury. Volunteers are provided with some medical expense coverage for injuries they may incur while assisting in an activity the Insured sponsors. Volunteers would not otherwise be covered under a General Liability Policy for their bodily injury. The policy contains exclusions for injuries to riders while hunting, racing on horseback, or participating in rodeos or rodeo type events. Also excluded: Pre-existing medical conditions; deliberate exposure to exceptional and unnecessary danger; person being under the influence of alcohol or drugs; any criminal act; hijack; kidnap and/or ransom; sports not directly relating to the business of the Insured; skin diving; rock climbing or mountaineering normally involving the use of ropes or guides, potholing, parachuting; driving or riding on motorcycles, motor scooters, or snowmobiles, or other motorized vehicles; hunting; or driving or riding in a race. Benefits payable under the policy are not in lieu of and do not affect any requirement for Worker’s Compensation Insurance. A riding student or horse rental rider is injured during a lesson or ride. PA Insurance pays for part of the student’s Major Medical Deductible. A volunteer is accidentally injured while assisting in a lesson or pony ride. PA Insurance pays for part of the medical expense. A club member is accidentally injured while participating in a horse show. PA Insurance pays for part of the medical expense. A club member is accidentally injured while helping with a club trail maintenance project. PA Insurance pays for part of the medical expense. Anyone can become injured when working with or around horses or other livestock. Prepare for personal accidents with horse insurance coverage for your specific business by calling our team at 1-800-328-8894 right now. Our representatives will provide you with detailed descriptions of each policy, so you can determine the best option for you.